Do you worry that you may not get the best fit when buying your glasses online? Well, try this for size! We've come up with a handy solution to your problem. 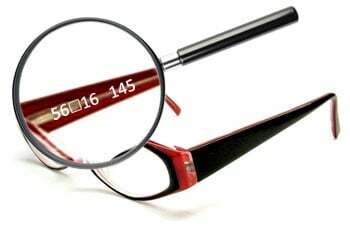 Simply have a look at the measurements on the arm of your comfiest glasses and enter them below. Click to submit the information and our system will cleverly list the frames we have that match the measurements you have given. All you need to do is decide on a frame from the list, enter your prescription details and sit back, happy in the knowledge that your new glasses will fit like a glove! Select a comfortable pair of glasses you already have. You will find the measurements on one of the arms (you may have to use a magnifying glass). Want to know more about understanding frame measurements?